A few simple ingredients with quick prep and you have this one-pot-wonder on the table in 30 minutes. Just cover your dried beans with water to soak in the morning and they’ll be ready to pop into your recipe in the evening. Fast, easy, amazing is this authentic and so very tasty dish. I like to chop the onions, garlic and celery into pretty small pieces. Feel free to rough chop if you prefer a chunkier soup. And try to keep to the order of steps in this recipe. It helps to really intensify the flavors of each ingredient and then bring together all of the subtle flavors of this soup. I think the celery is really the star here but in a wonderful way that doesn’t overpower the other ingredients. A good dish to make ahead and reheat too! Soak dried black eyed beans for a minimum of 3-4 hours (when they should begin to be visibly plumper) to as long as overnight. Add olive oil to 3 qt saucepan and saute onions and garlic on very low heat first. Once they’re just soft and translucent, add the celery. If you add the celery at the same time as your onions and garlic, the water that comes off the celery doesn’t allow the onions and garlic to cook properly. Cook for approx 2-3 minutes on low heat. Add salt, pepper, oregano, soaked beans and tomato paste dissolved in water to pan, stir to combine completely and let cook for 5 minutes to soak up all the flavors. Add water and fresh sprigs of thyme. Stir gently and cook, uncovered, on low simmer for 25 minutes until black eyed beans are soft. Remove sprigs of thyme when beans are cooked and serve hot with a piece of crusty bread. To reheat: add 1 teaspoon of water and heat on low, covered, for 5-10 minutes. Serves 2-4. Recipe is easily scaled, I’ve doubled and tripled these ingredients with very good success. Thank you for the great recipes and I can’t wait to try more! So very glad you enjoyed it! How long did you cook in the slow cooker. Also, did you combine all the ingredients at once? How long would you soak the beans for? My mother who has passed away used to make this healthy dish. Your recipe is perfect and brought back many happy kitchen memories of growing up Greek-watching Mamma cooking- she was always cooking! Thank you! Great recipe, the beans took much longer to cook than the recipe said, (as I expected) at least an extra 3/4 hour of cooking despite soaking for 24 hours. My husband scoffed the leftovers so I only got to eat it once. Will make again but might pressure cook the beans for a bit first. Had these yesterday. Mom makes her own version with onions and potatoes in thick gravy. Very smokey flavour and tastes better the next day. 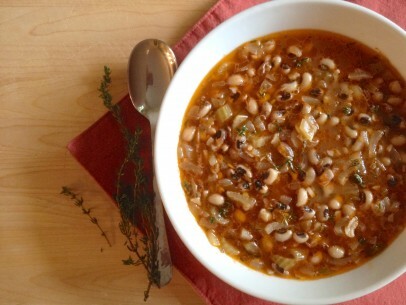 Can we use the canned black eyed beans? 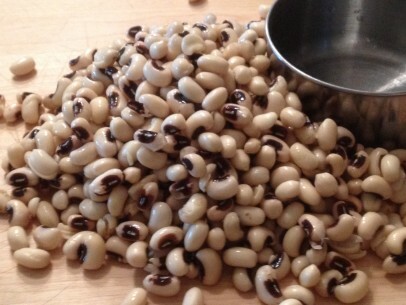 If you went with canned black-eyes (we call them black-eyed peas in the south), you could serve the dish as soon as everything is combined. In order to give the dish a chance to meld, I’d suggest simmering 20-30 minutes at a minimum and the longer you give them in the pot, the better the soup will be at the table. Not a fan of thyme. Could I use another herb? Any recommendations?